This app is designed to help kids Get Ready! for school. After entering a start time, you can create tasks for them including how many minutes it should take them to complete the task. 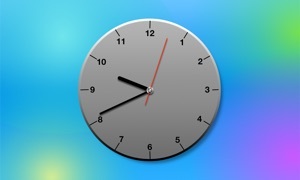 Once it is start time the tasks will appear next to the clock. The clock also has a green arc which appears while the current task is ongoing. In addition, the temperature and the forecasted temperature graph appear on the left so they'll know how to dress! Similar Apps to Get Ready!